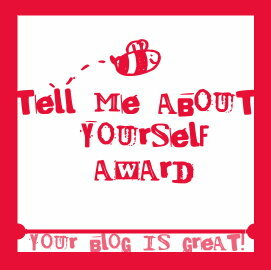 Blog Award - Tell me about Yourself !! | The Shopaholic Diaries - Indian Fashion, Shopping and Lifestyle Blog ! Hey people !! How's the weekend going?? I was having a boring one, sitting in the class and attending boring presentations when I checked my blog and read AGAM's ( from Trimmings & Lace) comment. She has awarded me with a - TELL ME ABOUT YOURSELF award !! I feel happy and elated now. Also since last few days I was receiving praise for my blog and efforts from some of my batchmates, whom I thought never noticed my blog or made fun of it. Thank and link back to the person who awarded you. Write 7 random facts about yourself. Pass on the award to 15 other bloggers. I plan to open my own multi-brand store in a couple of years, I hope I achieve this aim. I love to keep my room , wardrobe and other stuff in a very organized manner. I even keep a diary to record all the money I spend in a day and on what things I spend it. I started this blog while I was getting bored during my summer internship and read few other fashion blogs which inspired me a lott..
Till then thanks for reading my blog and supporting me always everyone. Congrats on your blogger award! I loved your facts! Good Luck with the store opening! Thanks for passing it along to me! thanks for the award nitika! following you now...kisses! I completely identify with what you wrote about yourself! OOOps!! I am such a bad girl who forgot about it. :'( I am sorry sweets.